As they arrive, they pass by a young boy who appears to be the same age as the older daughter. He nervously refuses to return her greeting. Clearly, this “meet cute” is a set up for a Budding Romance subplot – but nothing comes of it! How they could fail to take advantage of this is beyond me. The house itself is old and dusty, and as a neighbor claims, is supposed to be haunted. Aside from some “soot sprites” that look like black dust bunnies, there’s not a single spooky thing in the house. Another missed opportunity! And contrary to all custom, Dad is perfectly competent in fixing the place up – and the kids are more than willing to help. And they are competent, too! See what I mean about Bizarro World? You may be wondering at this point where the mom is. If this were a normal movie, we’d have a single dad struggling to raise two rambunctious little girls. Over the course of the movie, he’d meet a lovely woman whom he will marry. But this isn’t a normal movie at all. We are eventually told that the reason they moved to the sticks is to be closer to Mom, who is recovering in a nearby hospital. It’s never said what she’s suffering from. Given that it’s a small, rural facility, I suspect that it’s more of a sanitarium or rehab clinic than a full hospital. Whenever we do see her, Mom seems to be in great shape, if only a little tired. Here’s another chance for a plot or subplot. What’s Mom “recovering” from? A nervous breakdown? Drug addiction? What stresses is that putting on the family? We get none of that. Everyone acts perfectly content. Bizarro World, indeed! The irrationalities pile up as the movie goes on. The kids are allowed to play outside, completely without supervision. At school, the older daughter isn’t bullied or picked on for being an “outsider”. The kids are even allowed to walk on their own to a remote bus stop, and wait there until well after sundown for Dad to come home from work. In the rain, yet! What is wrong with these people? On top of all that, there’s no wise-cracking sidekick to add humor to the story. Speaking of the story, there isn’t even a villain! No bully picking on the kids who needs to be taught a lesson; no evil landowner trying to repossess the farm; there’s not even the threat that Mom might die from whatever mystery illness she’s suffering from. How can you have a plot without an antagonist? Eventually, something resembling a plot bubbles to the surface. The younger daughter gets lost in the woods near their home (again with the unsupervised wanderings! ), and meets up with a strange forest creature that she calls “Totoro”. Is this the antagonist? Nope! Despite his huge size and ferocious roar, Totoro is rather benign and is no threat to any of the characters. Don’t the moviemakers know anything about fairy tales and forest dwellers? Sheesh…. And then when she comes back home, Dad doesn’t do what every rational parent would and tell her she was just imagining things. Instead, he tells her that she probably did see something, but only because Totoro *wanted* her to see him. If no one else sees him, it’s because he didn’t want them to. And that is that. What kind of parenting is that? We finally get a real “plot” when the younger daughter decides to run off to visit Mom at the “hospital”. Since it’s a three hour walk even for an adult, everyone gets in a tizzy and goes on a massive search for her. This is before “Amber Alerts” and that sort of thing, so they are excused for resorting to doing it on foot. 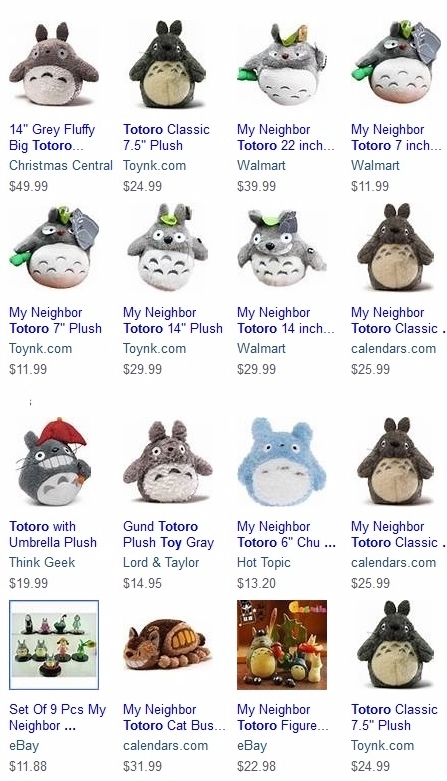 It’s probably not giving anything away to tell that Totoro figures in the search. In the end, everyone does apparently live happily ever after. But not a single one of the suggested plot threads is resolved. Mom is still “recovering” in the “hospital”, and the older daughter and that boy we saw early on still haven’t gotten together. This is so unlike any other movie in its genre that the only way I can recommend it is if you really do want to see something different, something where people are nice and decent and well-behaved and likeable (without being cloying or saccharine), something that avoids all the cliches of the genre, and something that even on top of all that is a sheer visual delight. At least they got the merchandising right…. This entry was posted in Reviews and tagged Hayao Miyazaki, Movie Review, Totoro. Bookmark the permalink.